If you go to Rockport someday, in Massachusetts, the United States, take some time to drive down Pigeon Hill Street and look out for a sign that says “Paper House”. Park your car near the sidewalk and go visit this unique, one story red house that looks like an ordinary log cabin, but is actually made of paper. The paper house began in 1922 when Elis Stenman, a mechanical engineer, began building a small summer home. It started out like any other home, with a timber frame, shingle roof and floors, but when it came to the walls, Stenman had different ideas. The walls of the Paper House is made up of layers upon layers of old newspapers, glued together until they are about an inch thick, then finished off with a nice coat of varnish. Everything inside the paper house is also made of paper. 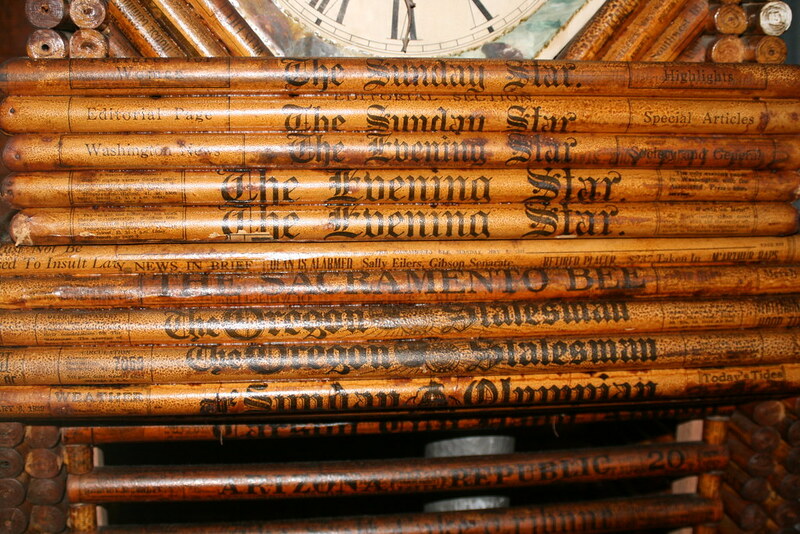 Stenman built chairs, tables, bookshelves and even curtains and a clock out of newspaper and magazine pages. Only the piano is made of wood and covered with paper to maintain uniformity, and the fireplace is made of bricks, for obvious reason. No one is sure what motivated Stenman to use newspapers. His descendants assume he wanted to try out a cheap and readily available insulation material during the time of the depression. Even the glue is home-made, made out of flour, water and apple peel. Stenman might also have been experimenting in recycling, or he might have just loved paper. After all, he designed the machines that make paper clips. Originally, he planned to cover the outside walls with clapboard, but the paper survived the first winter so well he decided that extra protection was unnecessary. Stenman completed the house in just two years, and lived in it until 1930, but he continued his experiments in paper recycling. In the twenty years Stenmans spent building the house and its many furnishings, he had used approximately 100,000 newspapers. After nearly ninety years, the top layers of the walls are slowly starting to peel off, exposing fragments of articles and advertisement from the past which visitors find delightful to read. On the writing desk you can catch the accounts of Charles Lindbergh's transatlantic flight, while the radio cabinet is plastered with news from Herbert Hoover's presidential campaign. The piano incorporates newspaper reports on Admiral Byrd's expeditions to the North and South Poles. As time goes on, more of of the walls will peel away, revealing news stores of the old. After Stenman’s death in 1942, the house was turned into a museum.